Are you going back to school after taking a gap year…or twelve? Are you going to school for the first time after spending years in the workforce? Is the prospect of investing the enormous amount of time and money needed to complete your degree looming over you like a dark cloud? Fear not, you may be closer to completing your degree than you think. In many schools, you can “test out” of lower level courses and required courses based on your course material competency from what you’ve learned in life. If your college doesn’t offer these tests, you can seek them out on your own. For example, the College Level Exam Program (CLEP) and DSST Standardized Subject Tests are open to the public and widely accepted by academic institutions. Testing out of lower level and core curriculum course requirements will put you further along your path to graduation, and clear the way for you to take more electives, pursue your interests through academics, and take higher level classes to that challenge you. 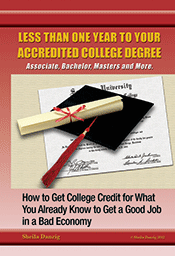 To learn more about getting college credit for what you already know, visit us at TheCareerPeople.com.